It's the season that brings us new art exhibits, music, movies, books, and plays and musicals. 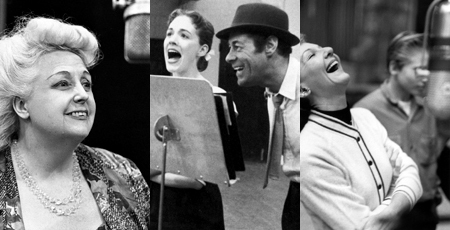 While finishing touches are at this moment being applied to various and sundry, we take a look in the rear-view mirror, courtesy of the photo galleries of hundreds of original cast recording sessions catalogued by Masterworks Broadway. This is an amazing trove of behind-the-scenes moments — performers and creators at the mic, rehearsing, coaching, and kibitzing, with production photos occasionally interspersed. Below are a few samples. Click here for the full galleries.